Happy Tax Day, if that's possible. Due to a series of factors, including a D.C. holiday and April 15 falling on the weekend, federal taxes aren't actually due to be filed until today. That said, more people than ever are filing their taxes early this year. 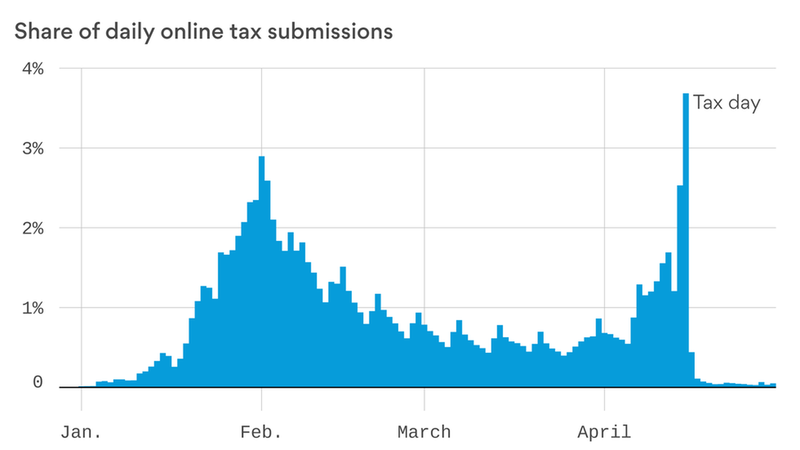 Adobe estimates that 59 percent of online tax returns were filed in January and February this year, with early traffic to online tax sites up 2 percent from last year. The exception is millennials, who are more likely this year than last to file on the last day, according to a survey. Adobe says 12.4 percent of millennials are expected to wait until the last 24 hours, compared with 6.6 percent last year. And while early traffic to tax sites was slightly up, overall the online shift appears to have stagnated. As the deadline neared, Adobe estimated that many filers gave up their online efforts and turned to a tax preparer. For more on where our tax refunds are going and whether people are turning to booze or ice cream for comfort, check out the full story. President Donald Trump is delivering on his campaign promise to overhaul the H-1B visa program that tech companies use to hire foreign engineering and technical workers. Today, he'll sign an executive order calling for an overhaul to move away from the current lottery system to a merit-based system that prioritizes higher-paying jobs, according to White House officials. Axios' Shannon Vavra has more here. The current lottery system undercuts American workers and pulls down wages, administration officials told reporters Monday, with "80% of H-1B workers being paid less than the median wage in their field...The result of that is workers are often brought in well below market rate to replace American workers, sort of violating the principles of the program." Expect the White House to engage with Congress over other reforms — for example, only Congress can change the 85,000 annual cap for H-1B visas. Bottom line: If Trump's directives move forward, companies will have to drastically re-evaluate their reliance on H-1B visas. The proposed changes would likely hit outsourcing firms the hardest. While many Silicon Valley firms employ H-1B visas to fill more specialized jobs, they also use them to fill some mid-level jobs (and also use outsourcing firms for contract work) so they'll also feel the pinch in some areas. Facebook today kicks off its annual F8 developers' conference. As usual, CEO Mark Zuckerberg, along with a parade of executives, will unveil a slew of new products and features — some more significant than others. Bots for group chats: Look for new set of these "chat bots" that live inside Facebook Messenger group conversations and provide various info and service, according to TechCrunch. For example, one could keep a group of football fans informed on the latest game scores. Secret hardware: Led by former DARPA director and Google exec Regina Dugan, Facebook's secretive Building 8 unit will likely unveil some of the gadgets it's been working on, according to Business Insider. More augmented reality: A big theme this year will be augmented reality. And while the pair of glasses (or contact lenses) Facebook is reportedly working on probably won't show up at the event, related technologies like camera filters will begin to lay down the groundwork, according to USA Today. Virtual reality: Last year, Facebook introduced its own 360-video camera rig, and demoed its take on social interaction in virtual reality — so expect more VR this year. Facebook may also showcase its newest headset, according to Variety. Check out Kia's full take here. Netflix CEO Reed Hastings had this to say about Amazon during the company's earnings conference call on Monday. QuoteAt one level Amazon is an amazing company…and then you think of Jeff Bezos doing Washington Post and (rocket company Blue Origin)… they're doing great programming and they'll continue to do that… but I'm not sure it will affect us very much. You watch a Netflix show you stay up late — we're competing with sleep. Bloomberg's Apple scoopmeister Mark Gurman has a look at the likely fall iPhone lineup and it appears that the company's high-end model will be a phone with a curved OLED screen that takes up most of the display with no visible home button. If that sounds familiar, it's basically the same approach Samsung took with its flagship Galaxy S8. If it does go that route, it will be interesting to see how Apple positions its device as different. Gurman reports this high-end model could be in short supply and come later than the more evolutionary updates. It also may feature a less aggressively curved display than Apple might ideally like due to supplier constraints, Gurman said. The new report is in line with previous rumored details, suggesting this could well be what Apple has planned. On Tap: IBM reports earnings....As noted above, Facebook's F8 conference starts today in San Jose. Trading Places: Want to? It's late and I am still writing. ICYMI: Uber may be forced to add an option for tipping drivers, if a New York proposal goes through.... NASA is planning to stream Tuesday's rocket launch in 360-degree video, meaning viewers with virtual reality headsets can be right there on the Cape Canaveral launch pad....Silver Lakes says it has raised $15 billion for its new flagship fund. Make sure you pay your taxes. Then reward yourself by (re-)watching the trailer for Star Wars: The Last Jedi. Hope today's newsletter wasn't too, um, taxing.